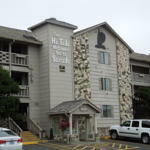 64 Unit motel with 42 Ocean Front Rooms - 1 & 2 bed units, 12 Partial View Rooms, 10 Non-View Rooms with 1 & 2 beds units. Located on The Prom and 3 blocks from downtown, we are within walking distance of various forms of entertainment, many wonderful dining experiences and only a few short steps to the beach itself. The Prom is 8800' long and provieds a beautiful walk along Seaside's famous beach front. We are 90 miles from Portland, Oregon's International Airport which makes it a short drive for a great vacation experience or a weekend get-a-way.